When you purchase AgileBits software your license will never expire and you can use it on the current version of the licensed application indefinitely. While the license itself will never expire, system updates from Apple could cause certain aspects of some software to stop working. If you are licensed to run 1Password 3 for Mac, then you can keep running 1Password 3 for Mac for as long as you want. This has not changed. With that said, 1Password 3 for Mac no longer receives updates. When it stopped depends on how you view a particular update. Version 3.8.22 was released in early 2014 but the last update with what I would view as meaningful improvement was in early 2013 and the last version of OS X that we refer to in the release notes is Mountain Lion. With the recent release of OS X 10.11, aka El Capitan, we are now on a third new version of OS X since we last worked on 1Password 3 for Mac. The situation is similar for the 1Password 3 Browser Extension, where the last version released (version 3.9.20) included compatibility with Firefox 26; the current stable version at time of writing is Firefox 41. So what do all the advances in OS X and the major browsers mean to 1Password 3 for Mac? What follows is a list of known incompatibilities with recent versions of OS X and browsers. The import feature (File > Import...) in 1Password 3 relies on system libraries that were updated in Mavericks. Sadly that update was incompatible with how 1Password 3 used the libraries and you cannot import in 1Password 3 for Mac if you're running OS X 10.9 or newer. The only workaround is to use 1Password 4 or newer to import. Your milage may vary here. 1Password 3 may not correctly identify that the Dropbox service is running. 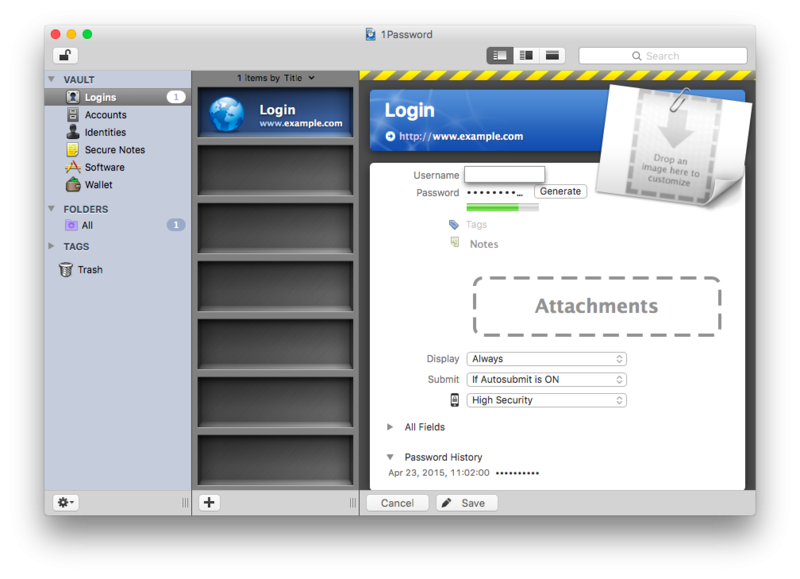 If this is the case the Move to Dropbox... button in the General tab of 1Password 3's preferences will not work. If this happens to you the workaround is to right click where it says 1Password.agilekeychain and select the third menu option in the context sensitive menu that pops up (Move Data File To Another Folder...). You can then select your Dropbox folder. Firefox removed the widgets module in Firefox 40 which the 1Password 3 Firefox Extension relied on. 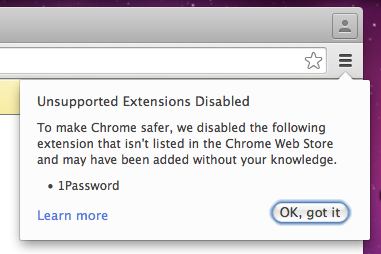 The options available are covered in our knowledgebase article: 1Password 3 extension missing in Firefox 40 or later. We recently had reports of item fields becoming invisible when editing an item. The text is still present, it just can't be seen. This has only been observed in El Capitan. The old 1Password 3 extension cannot work with Safari 12, which is available for Sierra and High Sierra, and built into Mojave. We've also had more reports of crashes on Mojave, likely due to cumulative changes made to the OS and its frameworks over this past decade. All software that runs on a particular platform, like OS X, relies on what the operating system supplies. When a piece of software is no longer being updated but the operating system it sits on is, this can result in compatibility issues. 1Password also needs to work with all the major browsers as well so we're also reliant on compatibility there. As long as all software is kept up to date incompatibility should be infrequent and temporary. If everything a particular piece of software depends on is updated while said piece of software isn't then with each update the possibility of a compatibility issue increases. If you want to run the latest version of OS X, Safari, Chrome, and Firefox the most pleasant experience will be with the latest version of 1Password for Mac. This isn't to say that your existing 1Password 3 for Mac license is invalid, it's just that it won't offer the same experience it is able to on older OS X releases it was designed to work with. We have recently had reports that item fields become invisible when editing an item in 1Password 3 for Mac if you are running El Capitan. The text is visible until you click on the field to edit. The text is still there, it just can't been seen when trying to alter it. In the following two images all that occurred was focus moved from the title to the username field. As you can see, the word "Login" cannot be seen in the first while focus is on the title and when focus moves to the username field the word user disappears but the title becomes visible. Depending on the cause, a future update to El Capitan might resolve this or it may be permanent. This issue is not present in the latest version of 1Password for Mac. Google Chrome: "Unsupported Extensions Disabled"
If the extension was originally installed from the AgileBits website it will be disabled by the browser, since Chrome is now requiring that extensions be installed directly from the Chrome Web Store. While Safari does not receive any updates from Apple on unsupported versions of OS X, Chrome and Firefox have followed suit as well. The latest versions require OS X Mavericks or later on Macs (Windows 7 or later on PCs). Please upgrade in order to take advantage of the latest security fixes and other improvements. And you can always have the latest version of 1Password for all of your devices with a 1Password.com membership.